I’m sure you think I’m crazy given the title of this weeks post but it really is the season for Sami’s soccer season to get underway. In fact, this weekend marks the true start to her 2017 campaign with her academy taking part in the Umbro Showcase Invitational U18 Tournament here in Toronto. It’s one of the big tournaments and will have 50 – 60 US College coaches and scouts in attendance. Of course, this only adds to the intensity of the tournament as everyone is out to impress, particularly given the high calibre of talent taking part, not only from all over Canada but also the North East US. This will be Sami’s third year playing in the tournament, the first year as a 14 year old she was a little intimidated, and last year she had a disappointing tournament and would be the first to admit it. Leading up to this year’s tournament she’s been playing well and scoring goals on a weekly basis for her Varsity team. I have a feeling that’s she’s truly ready to shine this year. Its fabulous to see her confidence growing and things are falling nicely into place, not only for this tournament but for her season in general. As many of you know Sami has been selected for the Canadian women’s U18 team to participate at the Maccabiah Games in Israel this July. So it seems as though all her hard work is starting to pay off…seemingly all at the right time! From the outside her soccer career seems effortless, moving from level to level with ease, but as any elite athlete will tell you to get to, and more importantly to stay at this level you have to work incredibly hard…all year round. The academy takes two weeks off in November each year to give the players a break, but other than that its full time. Starting in November she played a full indoor season in which her team won the league championship that featured teams from across the Greater Toronto Area (GTA). Added this was mandatory team workouts at a sponsoring gym once per week and then two x two hour indoor training sessions emphasizing skills and tactics. Yep, and that was the off-season! Her team then transitions into the outdoor season with training three times per week, in addition Sam also trains with her school team (early mornings) and plays at least one game per week. And finally playing for her academy in the Ontario U21 Competition. Last year Sami played mostly in the U21 team, but was also called up to the Women’s League One team for a number of games, so competing against adults, many of whom are either in college on a scholarship or have completed their college careers. The calibre of play is incredible and the pace of play mind blowing, but she seemed to fit right in and learned a few tricks along the way. As you can tell I’m so very proud of her and her accomplishments, but equally because of her dedication and fantastic work ethic. “The harder she works, the luckier she seems to get” often flashes through my mind when I think about how far she’s come. 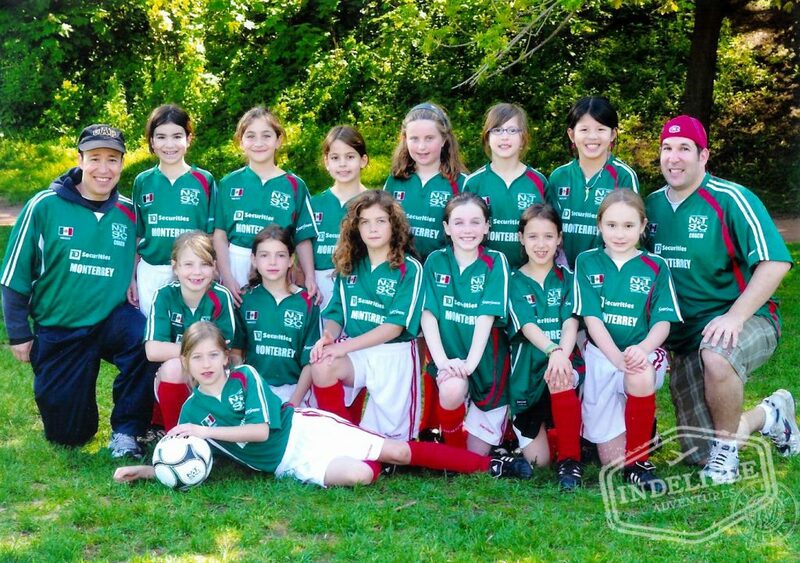 One of my fondest memories of Sami playing soccer is from when she first started at the local park in house league. She must have been only five or six at the time and from the first game she played she was totally hooked – she loved it! I can see her now, dressed in her uniform, which, like for many was way too big on her, hair pulled up into a pony tail swishing about as she ran back and forth over the field and scoring when ever she got near the ball. Every time she’d score she’d smile broadly and canter back to the center just so she could do it all over again. Yeah, the boys didn’t like playing against her I can tell you. Even today when she talks about playing soccer you can see the excitement in her eyes and the passion in her voice. However, I think the icing on the cake is that this summer she’ll be representing her country for the first time. Such an incredibly special moment or her and her entire family, both in Canada and Australia. I already know that it will be one of the most memorable moments in her life, not to mention mine! So I’d like to think that she and her team have a better than average chance of making it out of the round robin and into the finals. If Murphy’s law plays a part, and you know it will then its clear that Canada will play Australia for the Gold medal on July 16th. Now wouldn’t that be something. 0 Comments on "Tis’ the season!"